I’m a 23 year old PoliSci/Geography student currently in Berkeley, US, usually in Dublin, Ireland, and originally from Leicester, UK. Inspired more by a desire to travel than a passion for cycling, I left Leicester for Istanbul the summer of 2015. I'd learnt everything I knew about cycling from crazyguyonabike.com journals, and so travelled the way most people seemed to: slowly, on a Surly LHT loaded with 4 panniers and all my worldly possessions. I was lucky to meet, ride with, and learn from many other cyclists that trip, some of them going much faster and lighter than me. 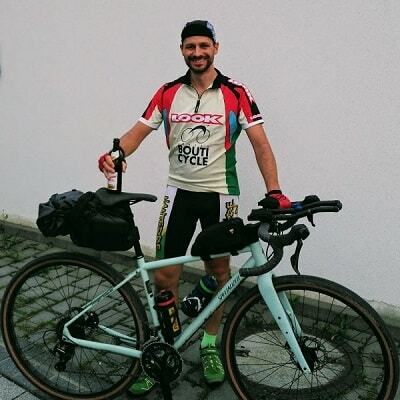 I first heard of bikepacking and the Transcontinental from Mel With The Apidura Bags, with whom I rode with from Brussels to Freiburg. Later, whilst lugging all my gear over alpine passes, I came to appreciate cycling in and of itself, and began to think a lighter approach might be nice! I got my first road bike for my 21st birthday in 2016 with the Transcontinental in mind. I finished a leisurely Transatlantic Way Race in 2017, and later that summer made it to CP3 in TCRno5. I scratched for lots of reasons, the most important being strict personal time constraints combined with a too-slow pace; by CP3 I knew I would not have time to finish. With no such constraints this year, my primary goal is to finish regardless of how long it takes - but I certainly intend to race! Belgian cyclist who loves a challenge now and then. In the daily life as a doctoral researcher on movement analysis. In the spare time by getting lost on the bike. I highly recommend thinking about the following quote; “We move information instead of simply moving”. Long listing of bike trips my friends and family find a bit odd; TCRn05 reaching CP3, Everesting challenge on the Kanarieberg, some other rides without a name to it and lots of coffee and cake. Jan Trouvé and his bike are two best friends. Jan started riding long distance rides as soon as he heard of the TCR four years ago. This was his motivation to ride not only the famous Belgian spring classics but also much further and longer. In 2017 he did not manage to enter the competition; but yes! in 2018 he made it. He is now in full preparation with riding home and abroad. The last few months he rode in Spain and the French Alps are upcoming in June. In between he'll catch some healthy Swiss air. His Specialized Tarmac Disc has been upgraded with the travel bags of Burabura. It is a real challenge to take as much as possible without being too heavy. Every kg is one too much :-) TCR is a dream coming true and the preparation is a nice part of this whole experience! Jason began cycling just 4 years ago after being asked to cycle the JOGLE for his late Cousin Sam, known for his Adventurous escapades Smith embraced cycling helping to set up an Oddballs Cycling group in his local Town & took on numerous challenges since. Jason entered the Hells 500 Everesting Hall of Fame with an average gradient of 16.9% and has managed London to Paris and Coast to Coast UK both sub 24 hours. Jason has just finished the TransAtlantic Way Bike Race in Ireland and hopes to be recovered in time for the ride of a lifetime for the TCRNo6. An avid dot watcher for many years and inspired to #bemoremike during his normal life Jason designs websites, online marketing and a property developer. Jean-Yves is a French guy fascinated by bicycles! He started very young on the bike of his father like a lots of kid, then riding with him to go to the bakery, the center of a town, … At 12 years old after few bikes, he boat his first one: a BMX! Then it was time for rides with friends on Mountain bikes in the surrounding woods. At 15 first big trip between Paris – Marseille with two friends self-supported, one year after the top 16 hills of the Alps with 4 friends. At 17 years old, he built his own Recumbent and participated in some championships. He was not really interested in the races, but more what was involved around… all these people building their bikes, finding a way to be more efficient. He took part in the French association of Recumbent for a while. After some life changes, he came back to mountain bikes with a group of friends, doing some 24h races, rounds in Switzerland in autonomy, … He discovered the TCR in 2016 by accident in the middle of the race! He found it interesting … In 2017 he came to CP1 to see some riders, and 2018 his marvellous wife gave him the “go to ride it” and end-it with a nice family holiday at the arrival. John Lee got into long-distance cycling late, and slowly. Venturing out of Bristol to visit friends on a sit-up-and-beg, he later found himself on a Brevet Populaire ('The Tasty Cheddar'). This led, by way of 'The Bryan Chapman Memorial' (BCM), to 'Paris-Brest-Paris' (PBP), and then on to the '1001 Miglia Italia' and the '999 Miglia di Roma e del Sud'. TCR No.6 marks a return to three-letter initialisms, and a big step up. If the TCR had Audax points, they would go to Audax Club Bristol. When it's over, he'll return to lecturing in English at the University. He's neither the first person from ACB, nor from the University, and certainly not from Bristol, to ride in the TCR. After 18 years of Wildland Firefighting, Jules found herself changing directions in her career, expanding her interests in outdoor adventures, and relocating to a mountain town 90 miles west of her hometown (with her husband, Patch). Jules is loving her new career in Water Operations, the freedom of her schedule, and the access to the outdoors. Jules started riding around 2012 after being encouraged to ride by her friends. Jules quickly developed a passion for cycling and has since enjoyed many miles on both road and mountain bikes. Cycling to her is about getting out there, loving the view and experiences, challenging herself, and discovering new limits. In recent years, Jules and her husband Patch have enjoyed sharing their excitement for cycling with many friends and their local biking community by organizing rides and weekend cycling trips. As far as racing, Jules has competed in a few 12-hour adventure races and a handful of triathlons. In August 2017, Patch and Jules competed as a pair in the 521-mile ultra-road bike race, (HooDoo 500), setting a course record for a married couple. This success leads them to their interest in a spot in the Transcontinental 2018. Patch’s belief that they can accomplish anything TOGETHER lead to the excitement of the TCR. I'm a film editor and my job requires sitting long hours in front of desk but I was always a very active person. I was playing tennis until my teens, than started running long distances when I finally, 5 years ago discovered cycling as perfect sport to burn my infinity energy. As I'm goal oriented and from nature competitive I started of course racing. Done grandfondos in Italy and Poland and after being on podiums and winning couple of times I realised it's still not enough for me. I needed bigger challenge to challenge myself. Then I met Jacobo Porreca and he told me about TCR. As for me cycling is also way of discovering new places, "eating distance", being curious what's behind next climb TCR seems to be perfects way to discover whole continent from perspective of two wheels. So I have been cycling more seriously since I started work as a bike mechanic in 2012. My job has taken me all over the world helping cyclist to achieve some amazing things, and hopefully this is my time.